The Geolocation module of Users Insights detects and stores your WordPress users’ geographical location. The information that the plugin detects is the user country, region and city. 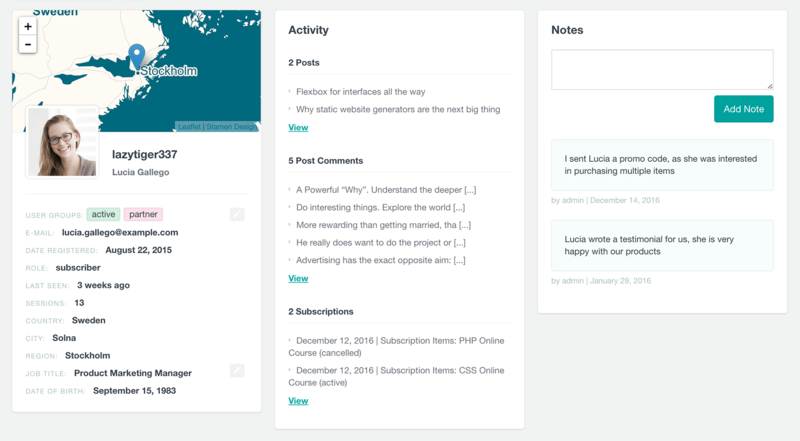 This information is available in the Users Insights user table and filters, so you can use it to search and filter your WordPress users by their geolocation data. If you ever wondered where your WordPress users come from, or which are the countries where your product is mostly used, you will love this feature. 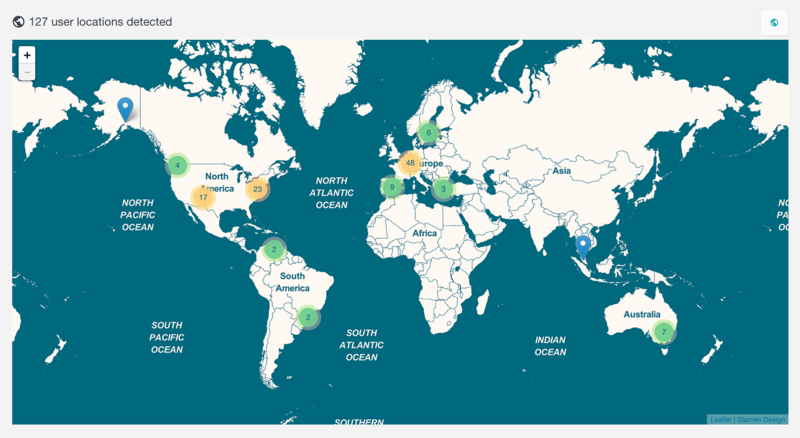 With the Geolocation module not only that you will get to know your WordPress users’ locations, but you can also see an interactive map of all your users around the globe. Once you install the Users Insights plugin and activate the Geolocation module, every time one of your WordPress users visits your site (when logged in), the plugin will detect their location based on their IP address. This information is then available for you the next time you browse the Users Insights user list. The user geolocation information is available in a few different ways with Users Insights. First, the WordPress user location is added to the user table so that you can quickly check the user locations when browsing the user list. If you open a user profile page, you will also have the user location information available in there, as well as an interactive map with a pin to the exact user location. The other way to see your users’ geolocation information is via the interactive map view that is available by clicking on the “globe” icon from the Users Insights menu. 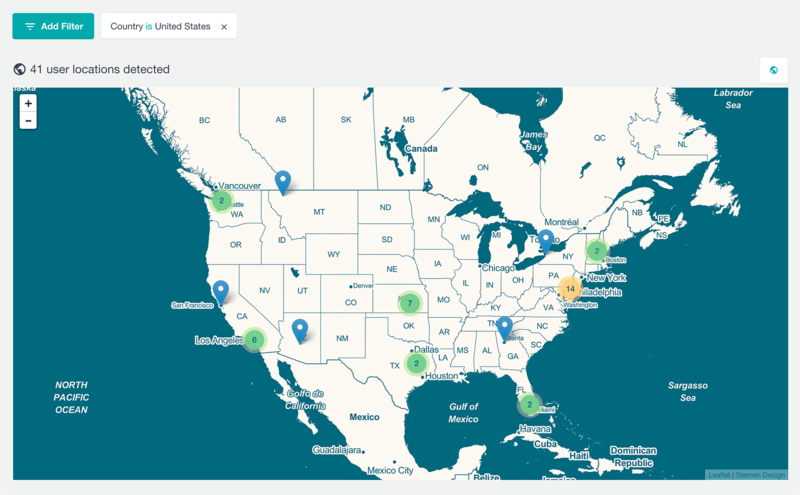 The interactive map gives you a world map view of your users’ locations. You can see a map of all of your WordPress users by switching the view from a list to map view by using the globe icon. You can zoom in, scroll and move around the map, just like you would with a normal Google map. For simplicity, the users that are located close to each other are grouped in groups and when zoomed in, the map shows more detailed locations for the selected area. In the map view you can also use the rest of the Users Insights filters that are not geolocation related. For example, you can filter your users by groups, number of posts created, last seen date, etc. 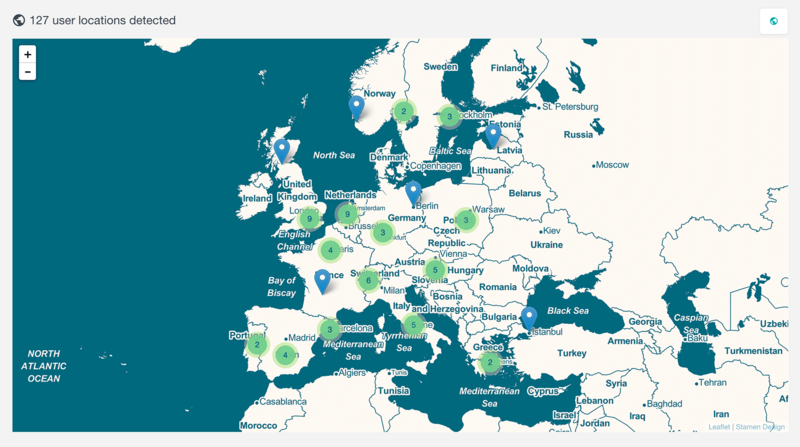 and see the list of the segmented user locations on the map. When you apply different filters, you can easily switch between the map view and the table view, depending on whether you want to see the list with user details on the table or just their locations on the map. The geolocation information is available for each WordPress user in the Users Insights table. The county, region and city data are added as separate columns and can be made visible/hidden from the eye icon menu. You can also sort your WordPress user list by the geolocation columns (country, city and region). To do this just click on the title of the column that you want to sort the users by. The “contains” and “does not contain” operators allow you to enter a partial information about the location and it works more like a search field. The “is” and “is not” are more precise and you should use them when you know the exact name of the location. Using “is set” to create a filter will select everyone on the list who we has the geolocation stored in the user table. These are all the users who have visited your website since you have activated the Geolocation module. The “is not set” operator is exactly the opposite. You can use it to create a filter for every user from the user list who currently doesn’t have the geolocation information detected. You can also combine the geolocation filters with all the other available filters, so you can create your own custom user segments. All the geolocation information about the user is also available in the custom user profile pages. In addition to the standard location info, the user profile page also contains a map with a pin of the user’s location. With the Users Insights export feature you can easily export the geolocation data of your WordPress users in a CSV format. Just by making the geolocation columns visible on the table, when you click on the export button, they will be automatically added to the exported file. Additionally, you can use the filters to segment the users by geolocation and export only the filtered user list.